New York State Professional Process Servers Association has the most comprehensive education and certification program in the country. We conduct seminars and exams on all topics related to process serving and attorney support services, including state and federal statutes. Our certification program allows our members to increase their knowledge by attending meetings, engaging speakers and continuing education classes. 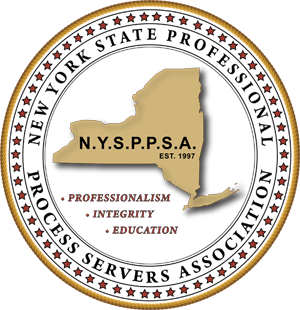 New York State Professional Process Server Association encourages everyone involved or interested in the Process Serving and Attorney Service industry to seek education and training in the field. To that end NYSPPSA is sponsoring seminars on the subject of how to serve civil process in New York. Recognizing the unique nature and value of the NYSPPSA Certification Course, NYSPPSA has made, and will continue to make, its seminars available to the public for a fee. Any person attending these seminars may be eligible for the designation "Certified Process Server" only upon becoming a NYSPPSA member, provided that admission to membership is made within one year of attendance at seminar. 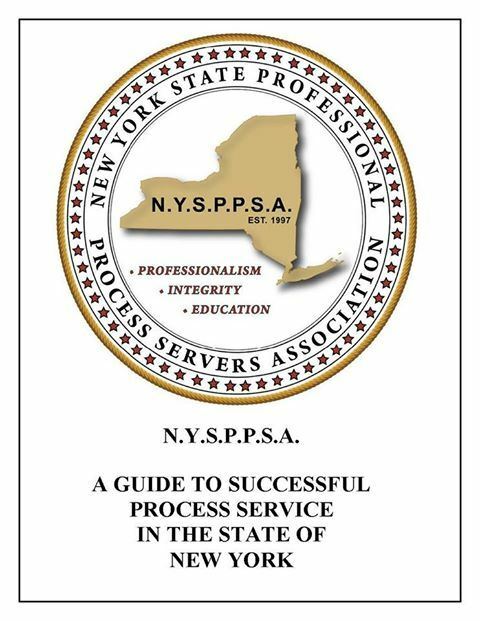 NYSPPSA is proud to announce that A Guide to Successful Process Service in the State of New York is now on sale through our office. A Guide is a comprehensive manual that explains the myriad of rules pertaining to civil process within New York State. Non-NYSPPSA Members - $125 plus cost of shipping and a one year basic NYSPPSA membership.